Gastrotrichs are minute (usually less than 1 mm) aquatic 'worms' that are one of those horribly obscure animal phyla that usually get allocated half a page in hidden corners of the textbooks, if they're lucky. 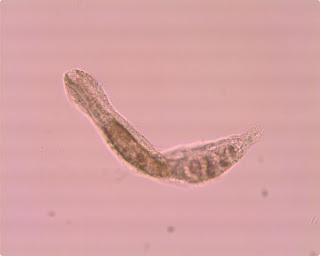 They are inhabitants of the interstitial - they live among and between the grains of sand and mud, where they hunt down microscopic algae and protozoa by crawling about on their ciliated bellies. 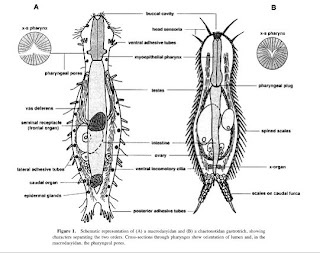 There are two distinct orders of gastrotrichs - the illustration above from Hochberg & Litvaitis (2000) shows an idealised representative from each. The animal of the right belongs to Chaetonotida, which have a fairly consistent bowling pin shape, covering of spined scales and two long posterior furcae each bearing a single adhesive tube. The more varied Macrodasyida, on the left, generally have a more elongated body shape and a greater number of adhesive tubes. The Macrodasyida are simultaneous or alternating hermaphrodites, while Chaetonotida have a higher diversity of reproductive strategies, including a number of parthenogenetic species. Macrodasyida are almost exclusively marine, with only a couple of exceptions; Chaetonotida are both marine and freshwater. The Dactylopodolidae are members of the Macrodasyida. Phylogenetic studies using both morphological and molecular data agree that the Dactylopodolidae are the basalmost family of macrodasyids, which makes them potentially very significant for gastrotrich phylogeny (Hochberg & Litvaitis, 2000, 2001; Todaro et al., 2003). They seem to have a fairly generalised body-plan - no extravagant ornamentation, relatively short body with a deeply lobed posterior, while the adhesive tubes are generally restricted to the posterior part of the body (Hummon, 1974). Their basal position is indicated by a plesiomorphic musculature and monociliated epidermis (Hochberg & Litvaitis, 2001). The Dactylopodolidae contains three to five genera (depending on whether or not the contentious genera Xenodasys and Chordodasys are included). The largest genus is Dactylopodola - the picture above comes from the Senckenberg Forschungsinstitut und Naturmuseum and shows Dactylopodola typhle - the linked site also has a close-up of its head that I recommend taking a look at. Get a good look - these appear to be the only images of Dactylopodolidae sensu stricto available on the web! Hochberg, R., & M. K. Litvaitis. 2000. Phylogeny of Gastrotricha: a morphology-based framework of gastrotrich relationships. Biological Bulletin 198 (2): 299-305. Hochberg, R., & M. K. Litvaitis. 2001. Macrodasyida (Gastrotricha): a cladistic analysis of morphology. Invertebrate Biology 120 (2): 124-135. Hummon, W. D. 1974. Some taxonomic revisions and nomenclatural notes concerning marine and brackish-water Gastrotricha. Transactions of the American Microscopical Society 93 (2): 194-205. Todaro, M. A., D. T. Littlewood, M. Balsamo, E. A. Herniou, S. Cassinelli, G. Manicardi, A. Wirz & P. Tongiorgi. 2003. The interrelationships of the Gastrotricha using nuclear small rRNA subunit sequence data, with an interpretation based on morphology. Zoologischer Anzeiger 242 (2): 145-156.